Last week, the Women’s Cross-Country team rested all but two runners after seizing third place at the 33rd annual Roy Griak Invitational, hosted on Sept. 29 by the University of Minnesota. There, the Mountain Lions ran against 22 rival teams, claiming third with a score of 89 points. The field consisted of 412 runners, of which Kayla Wooten, UCCS’ top runner and two-time U.S. Track and Field and Cross-Country Coaches Association (USTFCCCA) Athlete of the Week, was the victor by less than two seconds. Hanna Ellis took the No. 7 spot and finished as the top freshman in the field, beating the University of Mary’s Taylor Hestekin by just three tenths of a second. Corey Kubatzky, Head Coach of the Lady Mountain Lions, shared Ellis’ sentiments in an interview, adding that it was good to be home after a weekend of long travel. “We took a risk going into a big meet like that early in the season,” he said, speaking of 2018 Roy Griak Invitational. The team took 11 athletes, and, according to Kubatzky, 10 of those had “really good races,” with the 11th still recovering from a previous illness. Seven of the 10 finished in the top 50 spots, out of 412, with the final three finishing No. 52, 53 and 54. “You don’t usually have one of those days where everyone has a good day,” Kubatzky said of the team’s overall performance. “It shows what we’re capable of,” when everyone is healthy and competing at their best. 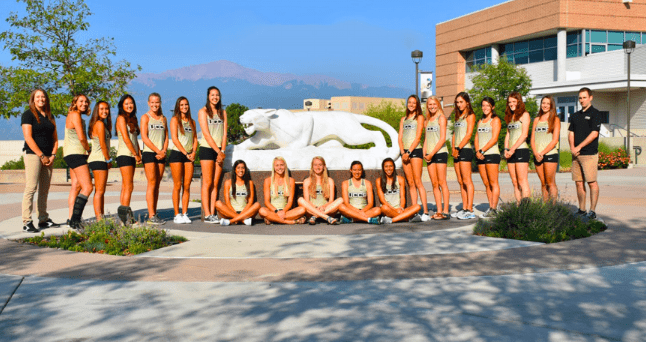 Prior to Roy Griak, the Lady Mountain Lions only appeared in two events, those being the UCCS Rust Buster and the Colorado College Invitational on September 1 and 8, respectively. At the Rust Buster, the team faced only four opponents. At Colorado College, they faced only six, far from the field of 22 teams that appeared at Roy Griak. “We’re in a really good spot,” Kubatzky said, as the Mountain Lions are injury-free and are currently battling no major illnesses. Prior to the Roy Griak Invitational, the Mountain Lions were ranked No. 15 in the nation, according to the USATFCCCA. After the meet, the USATFCCCA announced its Week 3 poll, putting the team in the No. 9 spot. They are now one of four Rocky Mountain Athletic Conference (RMAC) teams ranked in the top ten, with Adams State sitting at No. 1. They were also ranked No. 4 in last week’s USTFCCCA South Central regional poll. This week, the Mountain Lions will travel to Fort Hays for the FHSU Tiger Open 5k, where several teams from the South Central region are expected to compete. This will be the Mountain Lions’ final competition before the RMAC Championships on Nov. 3. After that comes the NCAA Regional Championships on Nov. 17, followed by the National Championships on Dec. 1.